*For the record, I don't know Greek mythology all that well. I've wanted to take a class on it for a while and have read The Odyssey and half of The Illiad... but besides that, I honestly don't know much so when I mention what I like, it's more of my personal experience than anything else. 1. (+/-) Helen, the protagonist - Helen had worlds full of potential, but I didn't feel like she quite made it. I liked her character in the beginning, liked that she knew she was different but kept trying to hide it. I liked her maturity (Dad & Kate relationships) and that she was shy & quiet--in short, she was the sweet girl who had loads of power and potential hidden inside her... and then she attacked Lucas! Wow. And I loved that she had more power than any of the other demigods... but as the book progressed, I was getting increasingly frustrated with her. She became whiny and selfish and wasn't willing to use her strength until so many pages had passed. And though she made a joke about hating "that girl" -- the one who lets her boyfriend take over her life -- she was starting to become her. I haven't given up on her yet though--perhaps she will embrace her strength in the later books. 2. (+) World-building - the Greek mythology that Ms. Angelini used was fascinating. I had never read about Aphrodite's cestus. I liked the idea that the demigods had their appearances based on those who had died in the Trojan war. I liked the idea of the Descender. I'm still a little confused about the House part, but I think that'll get resolved... Also Atlantis? Interesting twist... Kin-killing, hubris, and the hospitality the Delos family showed--all very Greek and work well in this story. 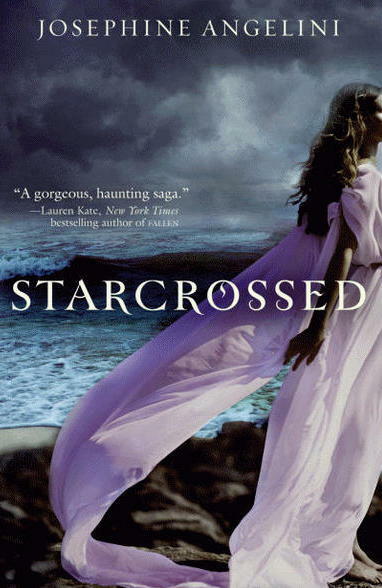 In short, the world she has woven together in Starcrossed was well-done and I can't wait to read more about it. 3. (+) The Romance - I approached this book a little warily when I read the summary... but then I read the first 100 pages when Harper had posted them and I loved the way their romance started out. The urge to kill each other? Wonderful. But then I think their transition to liking each other was a little too quick and sort of out of character for Helen. It was supposed to be a reflection of how quickly she felt at ease with people like her, but I am a naturally shy person too. It doesn't happen that quickly. The Furies made them hate each other, and without the Furies, that doesn't mean they know each other well enough to not feel awkward in the beginning at least..... Regardless, I still enjoyed the romance there and liked the idea of them building their connection--that is to say, they can't really do much else they start a war so they were becoming friends... who just happen to hold hands. Also, the Jason/Claire thing was interesting. I could see that happening. 4. (+) Cast of Characters - I liked the family dynamic and Helen's best friend Claire. They're all interesting, and I can't wait to see them developed more. I think Jerry, Claire, Hector, Lucas, Noel (matriarchal family!! yay! ), and Cassandra were done particularly well. Jason, Ariadne, Castor, Pallas, and Kate need more time... but then again it was just the first book. Point being--the characters added to the liveliness of the story. 5. (+) Book Felt Complete - The cliff-hanger at the end wasn't an annoying. It gave us a hint for the adventures of the next book without being completely surprising since she sets up for it throughout the book. [Random aside--I think that technique was done well since she used it for this book and to establish the next]. Also, they fought their battle in this book... but it's clearly not over. It's a good ending for the first in a trilogy. 6. (+/-) The Writing - Okay... though I think she did a good job establishing the world and foreshadowing, I also think there were too many details--that the book could have been tightened. What was the purpose of Helen's little burst about the Red Sox? Why was there so much emphasis on the food? These and other details that got repeated annoyed me because the book was 500 pages long. For instance, I feel like that Red Sox thing was just to emphasize that Helen was not "a regular girl" but it wasn't even developed so it was unnecessary.... Other than having some unnecessary details, the writing was done well. 7. (+) The Villain Twist - So who is the main villain? Are you supposed to trust Daphne? When will the Hundred Cousins come into play / Mildred/Tantalus? What about the Delos family itself--if Helen and Lucas get together, that is? I like the way we don't know what exactly is going to happen. 8. (+/-) Multiple POVs - Not sure how I feel about this. While I think that having multiple points of view helped establish suspense and gave us a sense of the character (in Creon's case), I think it was much too scattered and random to flow quite as well as Ms. Angelini hoped. I think that this is something she plans on continuing for the rest of the series though, so hopefully it won't feel so random the next time around. 9. (--) The Pacing - This goes back to the writing part and 500 pages complaint. Sometimes, I was honestly chugging through this book. I wonder if it really is just First-Book Syndrome--that she had to establish the world for the next two books. I sincerely hope so, but as much as I enjoyed reading about this Greek tragedy world, the first 100 pages were infinitely more exciting than the middle. 10. (+) The Cover - I like the Helen they chose on the cover. Makes sense if she's Greek that she's dark... and I like the shiny paper they printed it the cover on--it does make the storm in the background seem more real. I don't understand the flowing purple dress, but if I had just seen this book on a bookshelf, I would've given it a chance. Though I know some people have compared Starcrossed to Twilight, Starcrossed is in its own world. Loved the world-building and the villain twist & can't wait to see what happens in Dreamless, the sequel! This is my second review for the #30books30days challenge. Take a look at this list to see what's coming up next :). Wow, what a fantastic book this was. I loved every minute of it. It had my interest from the first page and kept me intrigued til the last!! I could not put it down!! I found myself trying to sneak time to read it as often as I could. I loved the romance story in it. When we finally see the boy Helen falls for, her first reaction is to kill him. It was weaved into the story so easily. It wasn't love at first site or they didn't get all over in love within a few pages and drive me crazy. This is another book on my TBR list for the simple fiction/mythology tale.I honestly believe you are correct in your assumption that this book may suffer from "First Book Syndrom". I find that a lot of first time authors tend to make the same mistakes, luckily most of them get better the more books they come out with. I am not a huge fan of dramatic cliff hangers because I am not a patient person and waiting for the next book always makes me irritable. So I'm glad to know there is a cliff hanger but from what you wrote it seems to be on the mild side. Those I can handle better. Thanks for another amazing review! Great review! I loved this book, probably because I am a sucker for Greek Mythology. I agree with you on the villain thing, it's hard to figure out who's a villain or maybe a character is just being shady, but that makes the book so good.